The spring has been very cool this year, last week being an exception. The nature really woke up due to a heatwave and the first rhubarbs have already risen from the ground. I love the fresh spring rhubarb, though I use this great plant for its whole growing season. 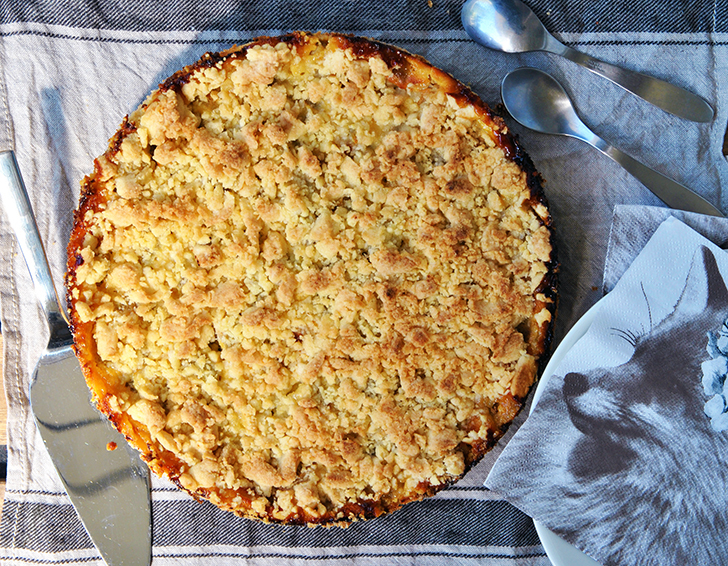 This recipe is one of my favourite rhubarb recipes, not only because of its crusty dough crumble topping but because it’s fast and easy to prepare. Another favourite of mine is the smooth rhubarb curd cake that I came up with when my fridge looked rather empty but my sweet tooth kept on telling me to bake something… I’ll share that recipe a little later. The ingredients of this recipe can be tripled for an oven rackful of rhubarb pie. The pie can then be cut in squares and served either as such or with something creamy, like vanilla sauce or ice cream. In a bowl, mix together the flour and 1 dl of sugar. Melt the butter and combine it with the flour mixture. Form two balls out of the dough, they should be approximately 2/3 and 1/3 in size. Wrap the smaller ball in a plastic foil and place it in the fridge. Turn the larger ball into a flat circle and place it in a cake form. Press the dough in the cake form with your fingers, lifting it 2 cm up on the sides. Wash and peel the rhubarbs and cut them into 1cm pieces. Mix together the rhubarb pieces, yogurt, 1 dl of sugar, eggs and the vanilla essence. Pour on top of the cake base. Bake the pie in the oven for 10-15 minutes in 175c. Take the pie out and crumble pieces of the refrigerated dough ball on top of the pie in order to get an even, crumbly surface. Continue baking until the crumbles are getting some color, approximately for another 15 minutes. Let the pie cool before serving.